No sooner had I completed the connection between the "A Whale" and Vale's Brazilian iron ore railroad, when I received a GPS alert that the "C Whale" was anchored at Sao Luis, Brazil, waiting her turn to load iron ore at the Ponta da Madeira Deep Sea Terminal. 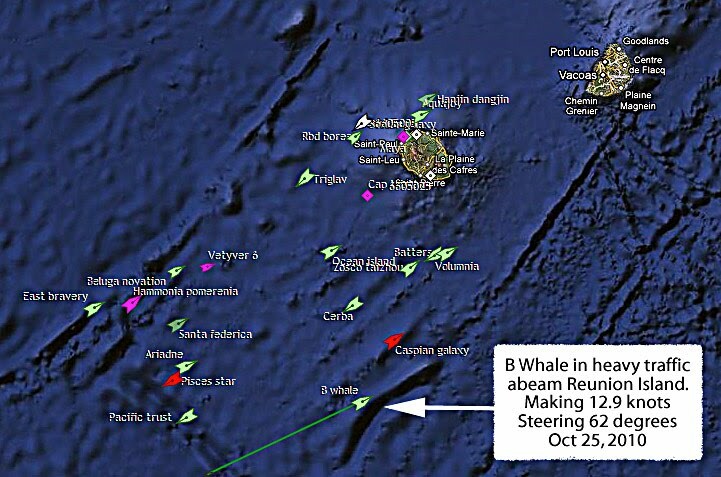 While these events were unfolding, I received further word that the "B Whale", returning from China, was heading for a place on the southwest coast of Africa named "Saldanha Bay." 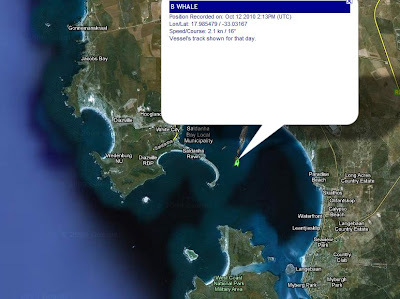 Naturally, I was curious as to why the "B Whale" would be going to Saldanha Bay. Bingo! 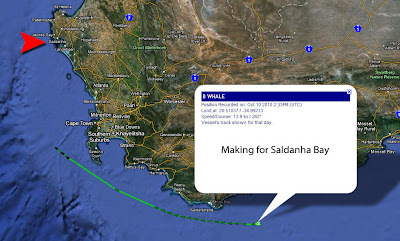 The "B Whale" was going to Saldanha Bay to load iron ore, delivered to tidewater by yet another Heavy Hauler: the Sishen - Saldanha Bay Orex line. So! 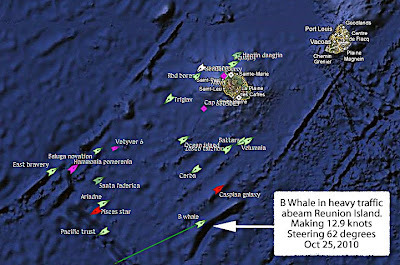 I reprieved myself once more, writing about a ship in a railroad blog, as I present "B Whale: The Rail Connection." Regularly scheduled operation of trains of at least 5000 tonnes gross mass. 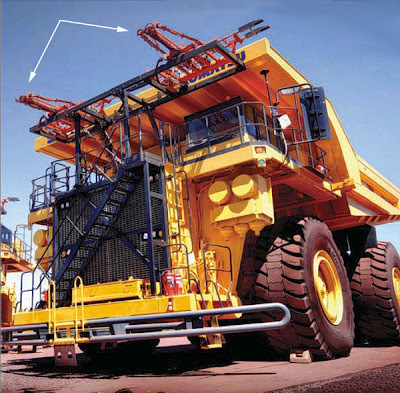 Must haul at least 20 million tonnes per year over a line haul segment at least 150km in length. 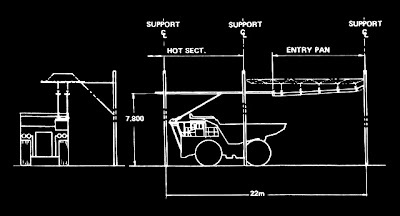 Regular operation of equipment with an axle loading of 25 tonnes or more. 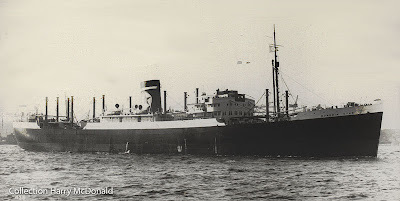 The "Heavy Haul" came to South Africa in 1976 with the commissioning of the Ermelo - Richards Bay coal and the Sishen -Saldanha iron ore export (Orex) lines. Transportation experts and International Heavy Haul Association (IHHA) member railroads have analyzed both systems for years. Lessons learned about physical plant and over-the-road operations is shared between all members of the Haul Association. Orex ore train at Strandfontein, 2004. Click > to play. While to most railroad hobbyist, a train is something big, noisy, and neat to photograph, "behind the scenes" railroads have become very high tech, as the need for greater efficiency has increased against slimmer profit margins. The iron ore railroads I have introduced are locked in fierce competition, with measurable effects on host nation economics. 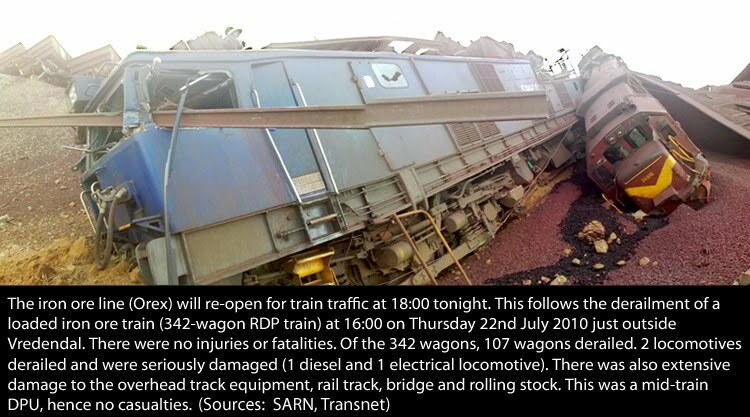 So much so, that a bad derailment can have wide ranging repercussions. So every aspect of these rail lines is meticulously fine tuned, right down to the ballast. That comment got a couple of "aw, come-on's" when I first mentioned it, but it is true. "Power Optimal Traction Calculation for Operation of Trains of Increased Mass and Length"
"Implementation of Distributed Power and Friction Control to Minimized the Stress State and Maximize Velocity in Canadian Pacific's Heavy Haul/Heavy Grade Train Operations"
"Technological Development of Chinese Railway Heavy Haul Freight Cars." 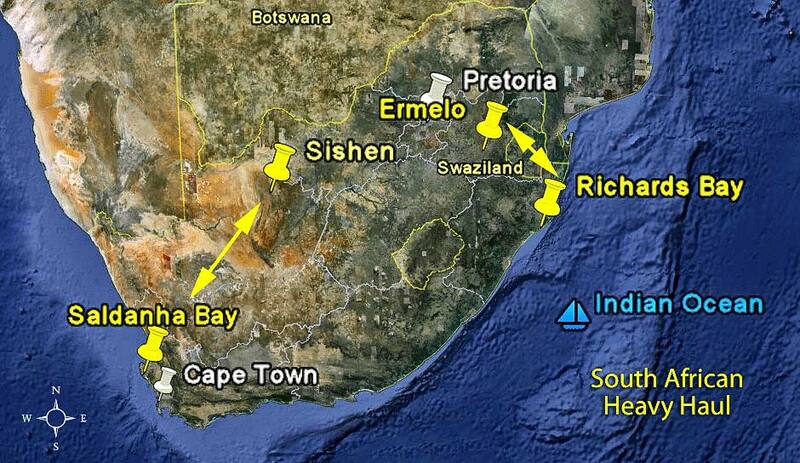 Iron ore and steel making play a major role in the history of South Africa. 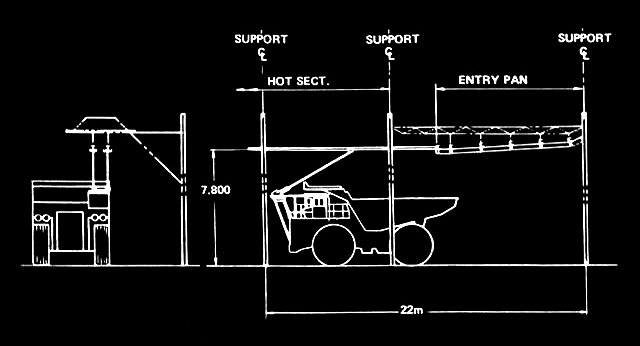 In 1916, the first ferrous ore mining operation in South Africa was established. In 1927, the government created South Africa Iron and Steel Corporation (Iscor), which is still the dominant steel producer in the country. Opened in 1947 by Iscor, Sishen is one of the largest open-pit mines in the world. The high-grade hematite iron ore extracted is classified as a "Lake Superior" type. Now in its 63rd year of operation, the open pit mine has gotten quite large! The pit measures approximately 12.4 km (7.7 miles long) by 2 km (1.5 miles) wide. Ascending gradients out of the pit fully loaded, the driver raises a pantograph, and the vehicle draws current from overhead lines. And unusual arrangement to be sure, found in only one mine in North America, at Barrick Goldstrike Mine in Nevada. 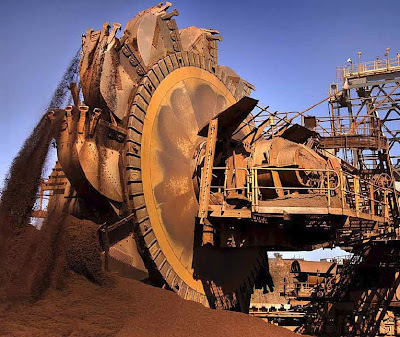 Ore is processed in a large Beneficiation Plant, a fancy word for a variety of processes whereby extracted ore is separated from the mineral sought and gangue. Gangue is the commercially worthless material that surrounds, or is closely mixed with, a wanted mineral. 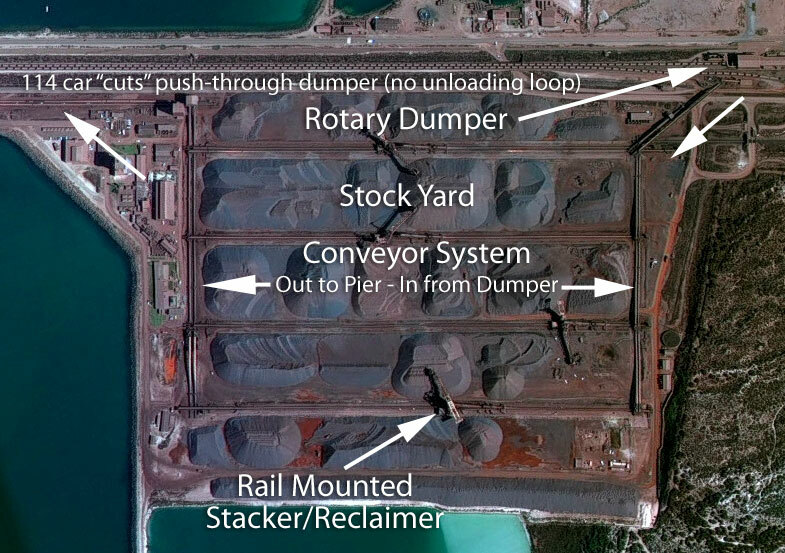 a reclaimer picks up the material and a complex conveyor system moves the the iron ore to the loading silo. Expansion of the pit required the settlement be moved 15km to the east, resulting in the founding of the town of Kathu in the 1970's. Approximately 28,000 Sishen mine and support personnel live in Kathu. 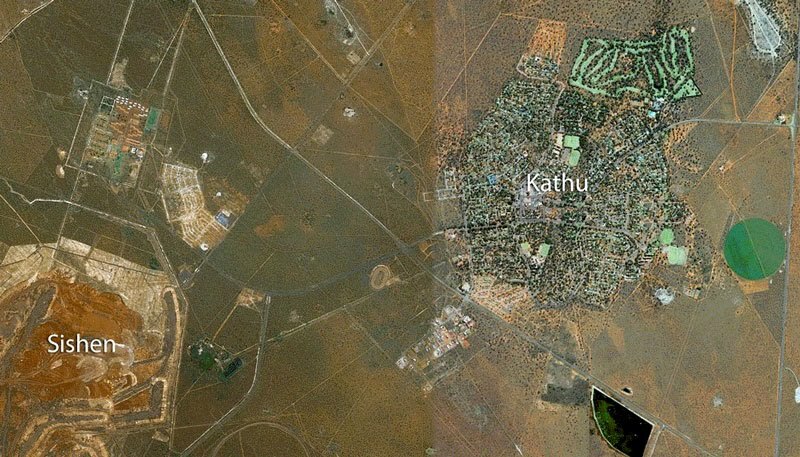 Kathu is close to a city you may be more familiar with, Kimberly, famous for it's diamond mine. Kathu means "town under the trees." 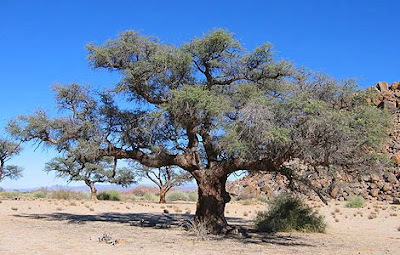 If you have seen movies of South Africa, you will quickly recognize the graceful Camel Thorn tree. I spent some time checking out the official web site in an effort to learn more abut the area. Had to chuckle when I found the results of a recent newspaper "reader survey." Sounds just like the teenagers here in Port Townsend. In doing my research, I occasionally ran into an unfamiliar language. I found "Kathu Leerders Besoek" in the Kathu Gazette. The language is "Afrikaans" one of 11 official languages recognized in South Africa. The language "Afrikaans" has its roots in seventeenth century Dutch, but is influenced by many languages including: English, Malay, German, Portuguese, French and some African languages. In 1989, with the end of apartheid, the government moved to privatize Iscor, and in 2001, Iscor hived off the iron ore mine, now operated by Kumba Resources. Secure deepwater harbors are rare on the desolate, mostly uninhabited West and Southwest coast of Africa. 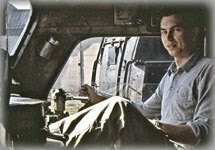 I get goose bumps when I recall as a teenager, reading a book my Dad had in his extensive marine collection entitled "The Skeleton Coast" by John H. Marsh. The name "Skeleton Coast" was invented by the author as the title for the book chronicling the story of the wrecking of the big British passenger liner Dunedin Star on November 29, 1942, and the eventual rescue of her more than 100 passengers and crew, at the cost of other lives, another ship, a big aircraft, a number of army trucks, etc. The rescue involved members of the Merchant Marines of several countries; the British and South African Navies, the South African Air Force, the South African Army, the South African Police and the South African Railways and Harbors Administration. It demanded from each man his utmost resources of courage, endurance, persistence, ingenuity, compassion and humanity, as well as intelligence and muscle. The book went through numerous reprints, and is now available on line. 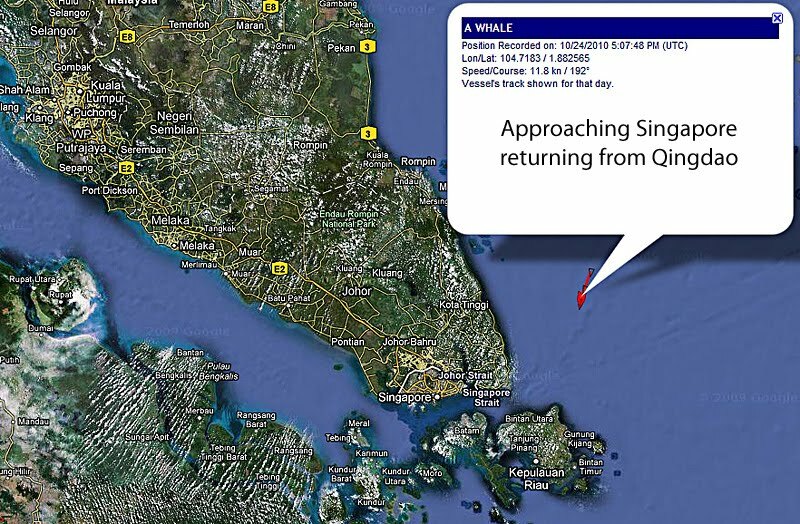 Here is a condensed presentation of the epic rescue effort. 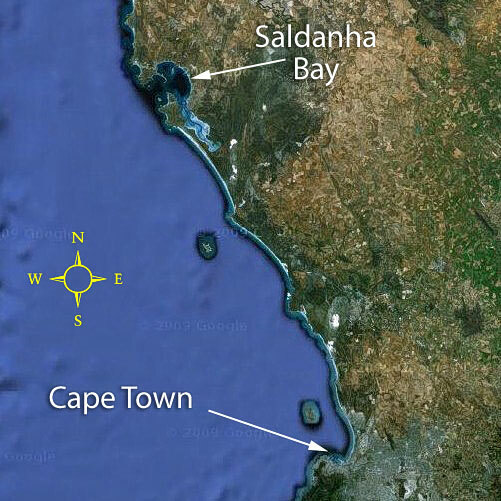 Saldanha Bay, 140 km (86 miles) north of Cape Town, was discovered by Portuguese explorers in 1503. But strange as it may seem, it was not discovered by Antonio de Saldanha, the man whose name it bears. Immediately recognized as a well-protected deep-water haven. But it lacked fresh water. 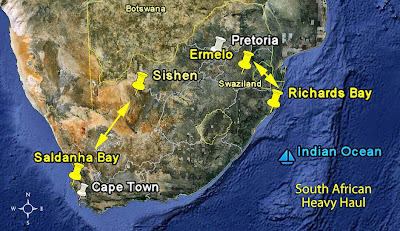 Not until the Second World War, when the importance of the natural harbor finally led to the construction of an 18-mile long pipeline from the Berg River, which led to further development. 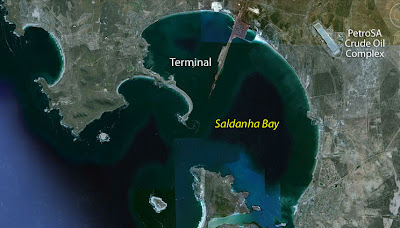 Today the Port of Saldanha Bay is a major asset to the South African economy and is managed by Transnet, an entity that manages ports and harbors, rail and airways. The port has a 3.1km (2.18 mile) long causeway/breakwater. This structure supports a tanker berth (365m, 1,197 feet) with a permitted draught of 21.25m (69 feet) alongside. The iron ore jetty (630m, 2,066 feet) has a permitted draught of 21.25m (69 feet) alongside, with two berths allowing two ships of up to 300,000 DWT to load simultaneously. The multi purpose quays (berths 201-203) are a total of 874m (2,867 feet) long with a max draught permitted between 12m (39')and 13.4m (43'). These handle break-bulk, container, and general cargo. 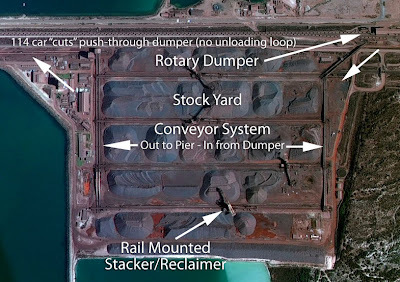 A total of 2.6 million tons of iron ore is stacked in four different stockpiles, according to type and grade and is ready to be reclaimed and transported by a conveyer-belt system to the iron ore jetty about 3 km (1.8 miles) away. Part of South Africa's strategic oil storage is stored at the Saldanha tank farm. Operated by PetroSA, the facility is massive. Six huge concrete containers, which hold 7.5 million barrels of oil each. 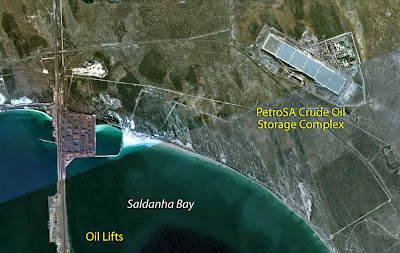 Built partly underground, the complex has a total capacity of 45 million barrels of oil, which makes it the biggest oil storage facility in Africa, and one of the biggest in the world. A pipeline links the facility to the quay. A measure of its size is that it would take the cargoes of between 20 and 22 very large crude carriers (VLCC) to fill the tanks. South Africa's strategic fuel supply of some ten million barrels is stored at Saldanha. One tank is allocated to Chevron and foreign oil merchants use the additional capacity. 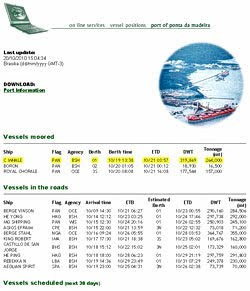 Total time spent by ships in the port, measured from arrival to departure and including piloting, berthing, loading, draft survey and deberthing is about 24 hours for a bulk carrier of 120 000 tons; 36 hours for a bulk carrier of 180 000 tons, 48 hours for a bulk carrier of 240 000 tons and approximately 60 hours to fill the "B Whale." 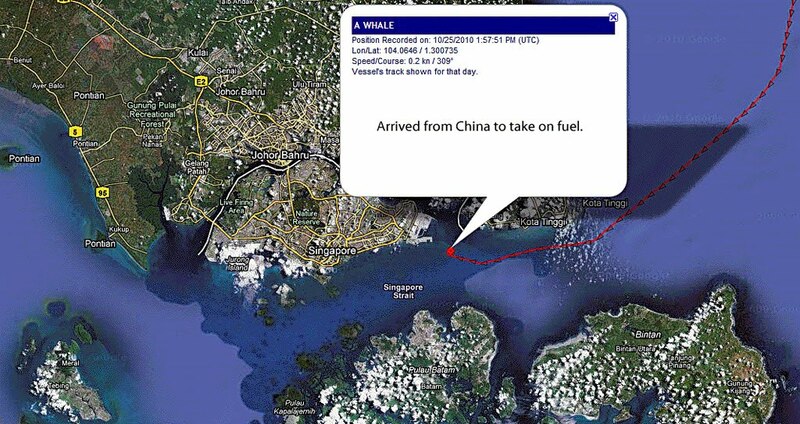 "A Whale" unloaded at Qingdao, destination not announced. The "B Whale" left Saldanha Bay and is now in the Indian Ocean. 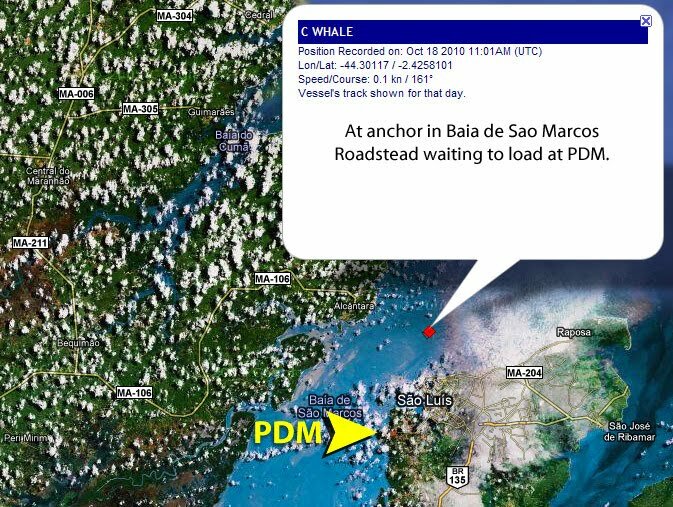 The "C Whale" completed loading at Pier 1 at Ponta da Madeira, departed Brazil with 264,000 tons of iron ore.In Brazil, eleven ore carriers at anchor waiting to load at PDM, with 33 vessels arriving in the next 30 days. 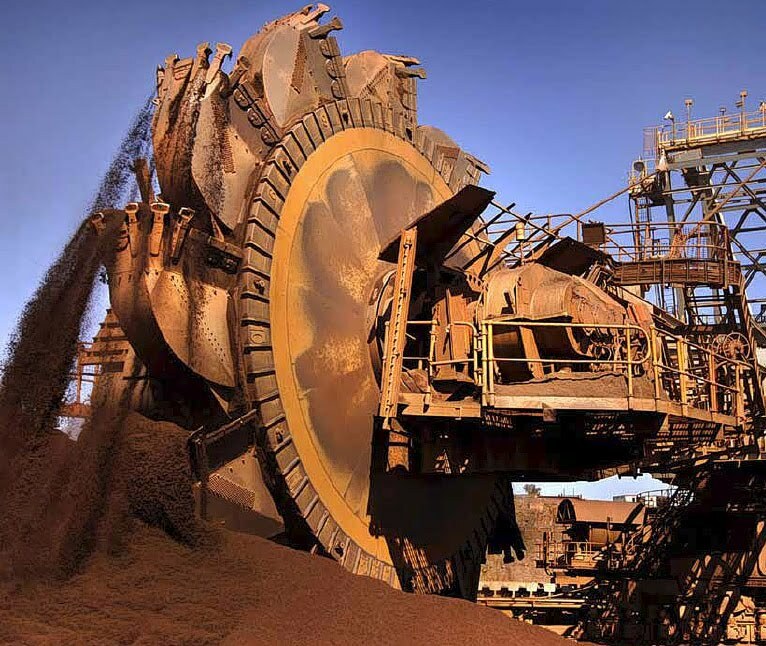 Those Heavy Haul iron ore trains must keep moving! 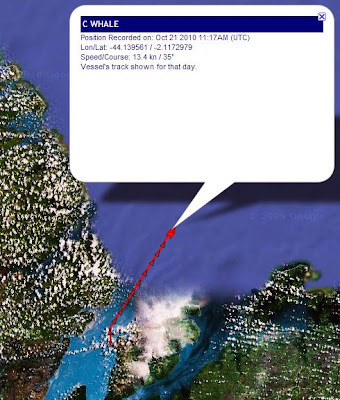 Next: "B Whale: The Rail Connection - Part II Electric - Diesel Trains on the Orex!